For those in the Caribbean, we certainly hope you are kind to your pizza delivery person if they are late with your pie, because they may have been traveling by plane. Mashable’s Brian Koerber reports on the greatest innovation in pizza since someone decided to stuff the crust with a bunch of cheese. 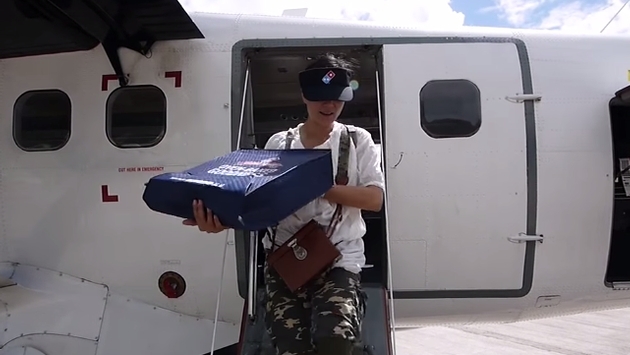 A YouTube video uploaded by Leslie Yip illustrates how some hungry island denizens get their pizza fix. Although there is some conjecture as to that last statement, because Mashable found that there is a relatively nominal fee for getting your pizza by air. Thanks to modern aviation, those in the secluded island of Saba can still enjoy a hot pie in about 30 minutes. Mashable spoke with Audrey Agard who is the manager at the Domino’s in St. Maarten and found that the service is available to hungry locals in both Saba and St. Eustatius. As for what it will set you back. Well, there is the price of the pizza and then a fee that is really rather cheap when you consider the mode of transportation. Now this isn’t door-to-door service, so you will have to leave the couch and head to the airport to get your pizza. Winair explains a bit more on the collaboration at its website. According to the release and Mashable, you are beholden to flights already scheduled to arrive at the respective airport. But if you are willing to schedule your hunger, you can be one of the few people on this planet to get their pizza delivered by airplane.